Next week our Healing Through Christ Family Support meetings will begin again with the Introduction to Step One. This is a great time to join us, either in person or by phone. We have many phone meetings, and they have the advantage of providing access to people regardless of their location. Participants can join and listen only, or they can help with the reading and share. These meetings become powerful sources of support and love. While our workbook talks about having a loved one in addiction, in fact many of the people who come to our group meetings have other challenges that they are facing. The Steps help us to experience hope and healing through the Atonement of Jesus Christ, regardless of the specific circumstances of our lives. Our focus is on the solution, not the problem, so often we don’t know why people come to our groups, unless at some point they decide to share their struggle. We support each other in coming to Christ—it doesn’t matter where we are coming from. No problem-solving that happens in meetings; we have no cross-talk, so no one is giving advice to another person. All solutions come through the Spirit. In meetings we simply read the Steps and the Spirit teaches and inspires the individual to find solutions, hope, and healing through the Savior’s Atonement. We discover how to experience the grace of Jesus Christ as a healing and enabling power in our lives every day. We see others who are in the process of using the Atonement of Jesus Christ to overcome a variety of challenges we don’t feel safe discussing at church; witnessing that success gives us hope for ourselves. When we survey anonymous participants about the ways in which Healing Through Christ meetings helped them or others, they list these challenges that were helped through the meetings and working the Steps. Emotional stages of response to trauma, loss, change in circumstances, etc. While every week is a great week to start coming to meetings, we will be starting from Step One over the next few weeks. Come join us by finding a meeting on our phone meeting page. You will feel love and acceptance and hope. The Healing Through Christ Recovery Workbook is now available! This workbook is designed to help men, women, and teenagers who are trapped in sexual addiction find healing and recovery. 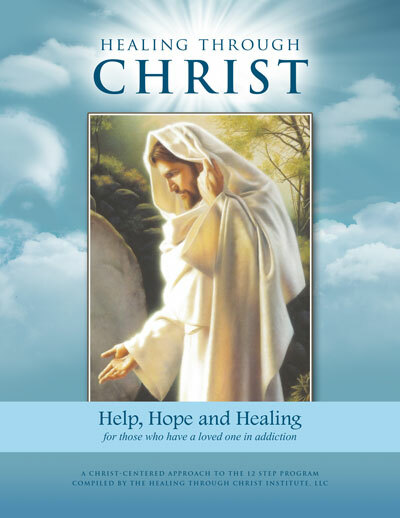 It is a companion to the Healing Through Christ Family Support Workbook, which is intended for those with a loved one in addiction. The Recovery workbook will support people with sexual and other addictions as they work the 12 Steps and come to Christ for hope and healing. The Recovery workbook is over 300 pages, and it is divided into individual sections to work each week. You can now order hard copies of the workbook at www.healingthroughchrist.org. The cost is $29.95 and includes shipping. A Kindle version will soon be available for download, and it will cost $14.95. The Working the Steps section was not included in the workbook itself, but it is currently in final development and will be available at the Healing Through Christ website. Right now we have one women’s meeting in Michigan that uses the Recovery Workbook. It meets on Tuesday nights at 7:30 pm; more information is available at https://thearborkalamazoo.com/phone-in-meetings/ We currently don’t have a men’s meeting. We’re excited this day has finally arrived! When I first attended Healing Through Christ 12-Step meetings, I was fortunate to find a meeting 15 minutes from my house. I was able to gather in person with other women and witness the success of the 12 Steps in their life and receive support from the group as I began my own 12-Step journey. I loved how safe I felt in meetings, and I was grateful for the love and acceptance I experienced. I felt a profound sense of loss when I could no longer attend the meetings, and I stopped working the steps. A few years later I was introduced to phone meetings. But what about the personal connection? What about the feeling of a safe space? What about the love and acceptance I felt from the other people in the meeting? I was grateful for the chance to read and learn about the steps again, but I anticipated missing the sense of community and support I felt in face-to-face meetings. Boy, was I wrong! I treasure the two phone meetings I attend now, and I feel that precious safety and support from my phone groups. I may not know the other members of the group in person, but I know their hearts and they know mine, and I trust and love each of them. Phone meetings are fantastic, and in fact, they have some advantages over face-to-face meetings. Phone meetings “are held to eliminate travel, make meetings accessible to more people, and provide a degree of anonymity that is not possible in a face-to-face meeting.” During a polar vortex, when the governor has declared a snow emergency, I continue to participate in my weekly meeting without having to leave my home. People who have limited mobility are not limited in their ability to attend. Those in an area where there are no local meetings can still be part of a vibrant group meeting on a regular basis. When I travel, I call into my meetings faithfully. If you have access to a phone, you can attend a meeting. Importantly, we remind participants who call in that while they are welcome to read and share, it is also perfectly acceptable to listen only. This provides newcomers an opportunity to “learn the ropes” and become comfortable with the group before speaking up. Sometimes no one knows about the challenge they are facing, and they can preserve their privacy until they are ready to become an active participant in the group. This is one of the unique advantages of a phone group. It may seem odd, but those who regularly listen only also become an important part of the group. They contribute in spirit, even if they never say a word, and their presence is felt. Perhaps the most valuable advantage to me is that while I am part of the group, I feel more connected to my Heavenly Father when I am calling in from home. I am not thinking about other’s facial expression, or my own, or checking in to see how others are reacting. I am free to listen more attentively to the Spirit. This attentiveness certainly happens in face-to-face meetings, too, and perhaps this is a distinction that is not shared by many, but I feel more attuned to the Spirit and more likely to write down promptings when I am calling in from my own home by myself. However, I still feel supported by the group, still feel that I can talk about hard things and feel the presence of loving witnesses, still feel the unity of a group walking the same healing path into the Savior’s arms. Have you tried a phone meeting yet? Do you know someone who would love to be part of a Healing Through Christ 12-Step meeting, but they live far from the closest meeting? All of our meetings have a call-in option; in fact, many of our meetings are call-in only, with no physical meeting space. There are meetings throughout the week, in the morning, evenings, and late evenings after children’s bedtimes. If you know someone who is nervous about calling in alone the first time, invite them over to your home and call in together. There is so much flexibility with phone meetings; they can meet needs in many different ways. What is consistent is the support and love and insight that we gain from other members of the group as we work this healing program together and feel the power of the Atonement of Jesus Christ working in our lives and hearts every day. Step Six invites me start with my heart, as I prepare to surrender my weaknesses to God. In previous steps I laid a foundation by turning to Him in trust, examining my life, and identifying the recurring patterns of weaknesses that have undermined my happiness and relationships. Now I “humbly and prayerfully seek the spiritual gift of a change of heart” (Healing Through Christ, p. 59). It can be frightening and discouraging to admit our weaknesses and prepare to release them. After all, at times they have been our protection, when we had no where else to turn, no other way to cope, no refuge to run to in our search for safety. But as we work the steps, we begin to find new ways to approach our challenges, and we can let go of “devices that once protected us but have now become self-defeating” (Melody Beattie, Codependent’s Guide to the Twelve Steps). I know that voice that accuses me day and night: it points out all of my failings, it tells me to hide in silence and shame, it convinces me I will never change. It is the voice of the accuser. But that voice is a liar. I am beginning to recognize the voice of my Advocate, Jesus Christ. He offers salvation and strength and entry into the Kingdom of God. His blood overcomes the accuser and renders him powerless. His voice helps me see my flaws when I ask, but that gentle awareness is always accompanied by hope through the power of the Atonement of Jesus Christ. The Spirit tells me that I can change, that He will help me, that through His power I can be transformed. I don’t need to be afraid or be ashamed. As the Lord invites me to see “what I lack yet,” I can become ready to release my grip on weaknesses that have been my lifelong companions, and turn to God with trust that He will help me to come unto Him and be healed. I love this so much. The reality of mortality is that we make mistakes, we do dumb things, we get tired and weak, and we sin. Despite all that we do to screw up and disappoint ourselves and others, we are still valuable children of Heavenly Father. He loves us. The choices we make do not shock him at all because He knows us better than anyone else, including ourselves. He never abandons us no matter what we do. We are the ones who turn away from Him when we feel shame, but the feeling of shame doesn’t come from Him. Satan wants us to feel that way and to hide from God. He wants us to feel bad about ourselves. He wants us to feel like we aren’t worthy of God’s love and grace, but we always are when we’re willing to receive it. God always loves us. That doesn’t change based on our behavior. The mistakes we make are part of His plan. We know this because He also planned for us to be saved by Jesus Christ. I’m so grateful that God gave me a Savior to save me from the wrong choices that He knew I would make as I learn to become more like Him. When I make a mistake and then turn to Him, He has the opportunity to teach me. Every time I sin and choose to turn to him in repentance, He turns my bitterness to sweetness. He gives me sweet lessons that make me better and wiser, closer to Him, and more like Him. I love His plan, and I love Him.